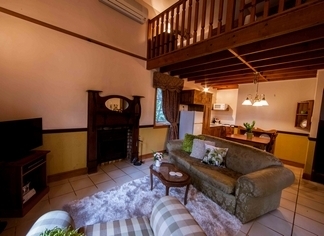 Experience Luxury Cottages hidden amongst the beautiful rainforests of Tamborine Mountain. Each Cottage tells its very own story. Lisson Groves accommodation and packages have been tailored to create the perfect retreat for two. Multi Award Winning Accommodation and voted QLDs No.1 Honeymoon Destination. 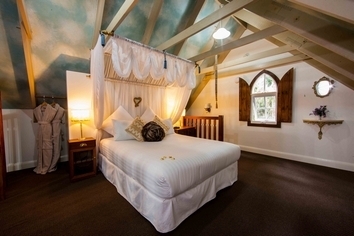 Luxurious, self-contained cottages designed and themed to create an ambient feel like no other. Champaign on arrival and our famous Gourmet Breakfasts delivered each morning at a time of your choice. All cottages are complete with a Genuine Log open Fireplace to set the mood. Unwind with the aid of complementary relaxation salts and bubbles in Large Spa. Lush Bath robes are supplied for the duration of your stay. Traditionally English. From the moment you open the white picket gate, you'd swear you were in "Old England".Once inside, you'll be overawed by a sense of luxury. An antique Queen bed and a cosy couch in front of the fireplace help create such ambience. The quaintest of the English inspired buildings. Two separate cottages each have their own individual charm. A Mezzanine floor bedroom overlooks the lounge and fireplace downstairs. Both the Gables East, West have magnificent fireplaces and furnishings. A church IT never was - but unique it certainly is! With its high peaked ceilings painted to resemble clouds and a fabulous loft bedroom. Designed with décor purely for the perfect romantic escape. A honeymooner's delight! Warm colours, a touch rustic and mementos of many a hunting trip. This cottage will take you back to a world where one's wealth was displayed for all to see. The front porch is the perfect place for breakfast while enjoying the perfect surroundings. An onsite Day Spa and restaurant for Dinning. Opening Soon!! Please contact Lisson Grove if your arrival time becomes any different to the original time made when booked. Lisson Grove is couples accommodation only. Each cottage had been designed for two adults only. An open, off street guest car park is provided. Drive south out of Brisbane on the main highway, towards the Gold Coast. Take the Tamborine Mountain / Oxenford exit. Follow Tamborine Mountain, Oxenford Road to the top of the mountain. Turn right at the first round-about. Follow Long Road until you reach Lahey Road. Turn right into Lahey Road. Turn left into Main Western Road. Lisson Grove is situated at no. 274 Main Western Road. If you anticipate that your arrival will be after 6pm you will need to contact our office. A variety of Massages and treatments can be organised at our very own onsite Day Spa. Weather you prefere Hot rocks or Deep tissue, all massages take place in the privacy of your own cottage.